Mindy is a licensed attorney in the state of Ohio. She is also a Certified Public Accountant "inactive" (CPA) and was a former senior tax consultant at Ernst & Young in Cleveland. As a result of her expertise, Mindy is able to help personal injury victims and their families understand the financial issues involved in litigation. 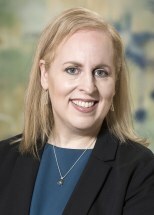 In addition, her extensive legal research experience enables her to stay up-to-date on the most current legal issues affecting personal injury victims. $145,000 – Motor vehicle accident results in multiple injuries (May 2016) The Defendant rear ended the Plaintiff’s vehicle, resulting in surgery to repair a broken screw and a loose screw from his prior neck surgery. $85,000 – Motor vehicle accident results in multiple injuries (Dec 2016) The Defendant went left of center and hit the Plaintiff who was a passenger in a vehicle. Plaintiff suffered a concussion, neck and shoulder pain as well as permanent loss of taste and smell. $80,000 – Dog bite results in multiple injuries (Sep 2016) The Defendant’s dog chased the Plaintiff into her garage and attacked her, causing multiple wounds to her knee, thigh, calf and arm. $71,000 – Motor vehicle accident results in multiple injuries (July 2017) The Defendant ran a red light and hit the Plaintiff who was a passenger in a vehicle. Plaintiff sustained injuries to her neck, back and right elbow. $65,000 – Motor vehicle accident results in multiple injuries (Sep 2016) The Defendant ran a red light and hit the Plaintiff resulting in injuries to her knee, ankle, head, neck and shoulder, and required surgery to repair a drooping eyelid. $60,000 – Dog attack results in knee injury (Jan 2018) The Defendant’s dog jumped on the Plaintiff causing injuries to her knee, requiring her to have knee revision surgery to repair her prior knee replacement.